Sweet syrupy balsamic vinegar is the secret ingredient for these delectable and moist Balsamic Blackberry Scones with Olive Oil. I am addicted to scones. Actually, I am addicted to fresh baked goodies, but I have a special place in my heart (and in my belly!) for scones. I love that they are mildly sweet and typically studded with fruits. And they pair beautifully with my morning tea, which I can NOT do without. Ever. My 10-year old daughter has developed a hankering for scones, as well. That’s my girl! And since I began baking scones with extra virgin olive oil and NOT butter, we have been enjoying scones more often. My previous olive oil scones showcased red currants and another was more savory and were studded with cherry tomatoes. 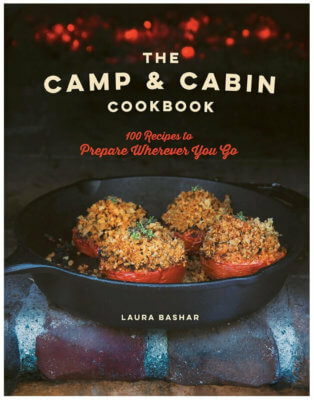 My cookbook features a whole wheat olive oil scone. 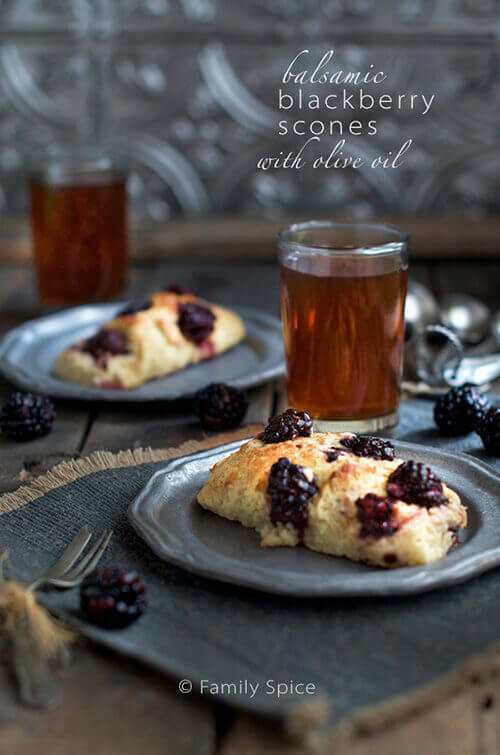 Today I am sharing olive oil scones that are bursting with blackberries and bathed in balsamic vinegar. And the beauty with balsamic vinegar (unlike it’s olive oil counterpart) is that the older it is, the better! So you see, oil and vinegar isn’t just for your salad or veggies! 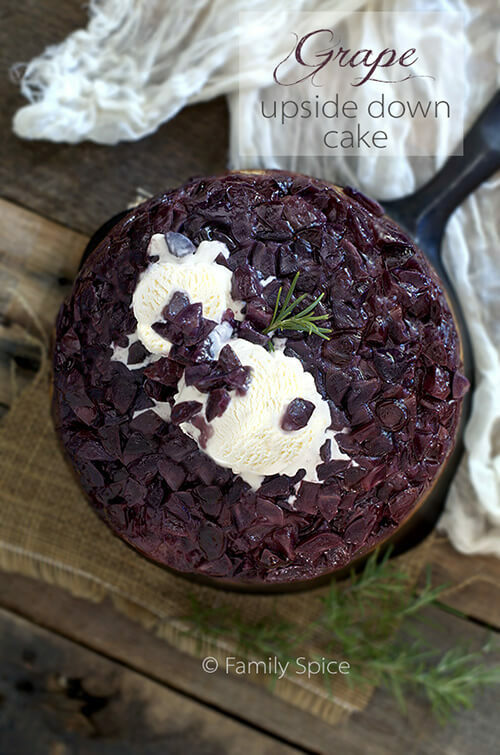 Balsamic vinegar is heavenly in baked goods, especially when you use a flavored balsamic vinegar. 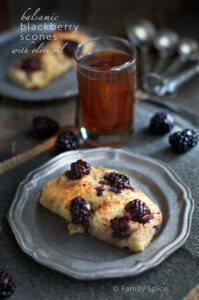 For these blackberry scones, I used a vanilla balsamic. Dreamy! For my grape upside down cake, I used a fig balsamic. Heaven! Don’t have a flavored vinegar? 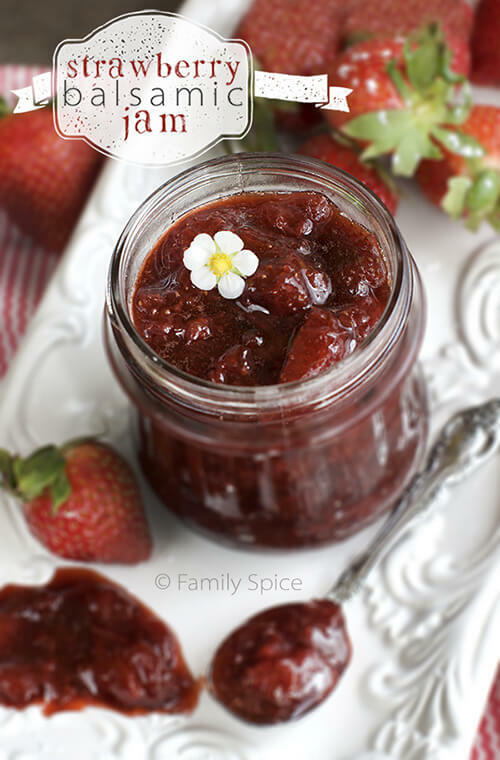 A plain balsamic will still work beautifully, like the one I used for my strawberry balsamic jam. Well, I better get back to baking! If you have not been baking with extra virgin olive oil, or even balsamic vinegar, what are you waiting for??? Pour balsamic berries (and juice) over half of the dough and gently press in. Fold the empty half of the dough over the berries, pressing the two layers together. Pour and press remaining berries over the top of the dough. Cooking Tips: Use a plain balsamic vinegar or a flavored one like vanilla or fruit. Use a mild, buttery, herb or citrus infused olive oil. Had a hankering for baked goods today and although I knew the scone would be different from the recipes I’m used to making because of swapping oil for butter, we were not disappointed. 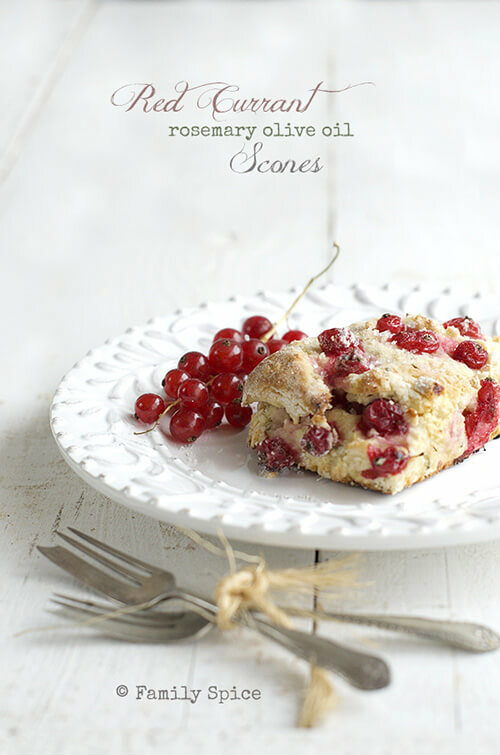 This is so quick to throw together and the macerated berries are wonderful in this soft, melt-in-your-mouth scone recipe! Yay! I’m so glad you liked it! I love my olive oil scones especially because they are so easy to throw together!